The genius that happens every day in the offices of the world requires a certain amount of focus. Unfortunately, most offices are awash with both physical and mental distractions that pull our attention away from the task at hand. To help you identify common pitfalls, we've zeroed in on the top five productivity killers in the modern age. Better still, we gathered expert advice on ways to block out the noise and get to work. 1. Social media Rieva Lesonsky, CEO of GrowBiz Media & com, admits her primary distraction is self-inflicted. "Social media can take me off task, especially Twitter. (I'm addicted.)" RELATED: The science of cuteness: how looking at baby animals increases productivity It happens to the best of us. You're at a lull in your work, and you get that nagging sensation that something amazing might be happening on Facebook. Why not take a quick peek, just to make sure the world's not passing you by? These brief breaks may seem harmless enough, but making compulsive social media checks during the day can add up to hours a week of lost time. Instead of checking Facebook or Twitter throughout the day, try scheduling your social media time after lunch and limit it to 15 minutes. Having a special time slot for checking out the latest hijinks of Grumpy Cat will leave the rest of your day free for more productive endeavors. And if you really can't help trying to scratch that itch, consider blocking your most visited social websites with your browser's security settings. 2. A crazy commute If you live or work in a large city, the morning commute can be an exercise in extreme frustration. What should be a 15-minute drive can turn into an hour or more of unproductive stress during rush hour. Fortunately, thanks to cloud computing, working remotely is easier than ever. With web-based software and collaboration tools, office workers can get everything done even when they're miles away from home base. More and more, corporate leaders are warming up to the idea of telecommuting as remote employees report higher productivity and morale. Even if you can't work remotely all the time, you may be able to slightly shift your work schedule so you're not traveling at rush hour, or just handle the first hour of your workday from home before you hop in the car. 3. Loud-mouthed colleagues Who can't relate to this scenario: you're just settling in for some hard-core focus time to bang out a monthly report when the guy in the next cubicle starts in on a high-volume recap of last night's episode of Game of Thrones—and you haven't seen it yet (spoiler alert!). Working in an office can be great for collaboration and easy communication, but not so great when you're doing focused solo work. Diplomatic requests for quiet might buy you a few minutes of peace, but let's be realistic: some people do not possess an inside voice. Treat yourself to a pair of noise-canceling headphones and crank your favorite background tunes or soothing sounds from a white-noise website like Noisli. 4. The unfocused workday You may have a truckload of work, but without a clear plan of attack, you may leave the office that night wondering what you got done and why you spent time on the wrong tasks. Ramon Ray of Smart Hustle Magazine zeroes in on the root of the problem. "Lack of clear understanding and planning. When I'm clear and highly organized, things flow!" Jeff Marcoux, CMO lead for Worldwide Enterprise Marketing at Microsoft, agrees. "Randomization is the killer of productivity." To get his house in order, he spends the first 10 minutes of his day making an explicit to-do list, following guidelines set out in this Harvard Business Review article. If you have trouble organizing your tasks, check out a mobile productivity tool like ToDoist or LeanKit. 5. Email It's impossible to avoid in the modern workplace, but email is as much a hindrance as it is a help. Andy Karuza, owner ofBrandBuddee, notes, "being 'too connected' can be a major productivity killer. This is because task switching wastes lots of time from having to reset your train of thought and pick up where you left off on the previous task." Answer emails and social media messages together at the top of the hour. Knock them all out at once and then wrap yourself up again in that Excel spreadsheet you were working on. Your email inbox forces you to switch focus from your task at hand, wasting precious minutes of your targeted energy. Karuza suggests taking a structured approach. "Answer emails and social media messages together at the top of the hour. Knock them all out at once and then wrap yourself up again in that Excel spreadsheet you were working on." You may also be doing work that is better done by a machine. Try to automate some basic email tasks to help you prioritize your inbox so those sprints of replying to email are as efficient as possible. 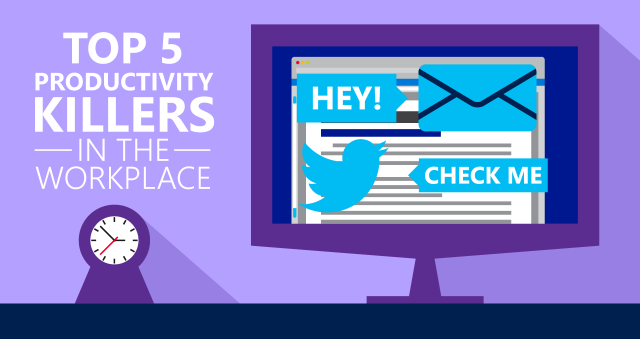 Whether you're working from home or at the office, there's always something there to distract you. Identifying your own biggest distractions is the first step to eliminating them. How do you conquer your workday productivity killers? Share your secrets onFacebook or Twitter.